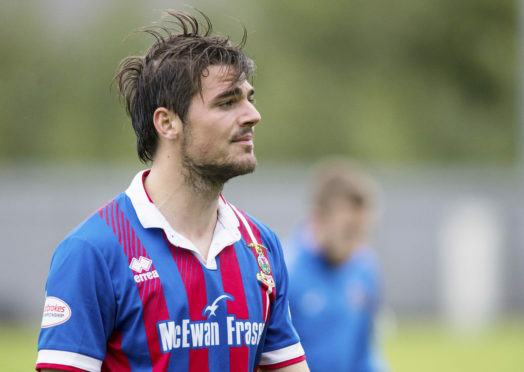 Caley Thistle midfielder Charlie Trafford feels Inverness’ team spirit has come to the fore at a time when John Robertson’s squad has been stretched. Trafford was one of just two players over the age of 20 on Caley Jags’ bench for Sunday’s 1-1 draw against League 2 Edinburgh City in the Scottish Cup, with the replay to take place next Tuesday at Caledonian Stadium. Inverness will host Lowland League side East Kilbride in the fourth round if they progress past James McDonaugh’s side. Caley Thistle have been left light in numbers in recent weeks, with right back Shaun Rooney returning from an ankle injury to face City, while skipper Carl Tremarco and midfielder Angus Beith remain sidelined – although Robertson is hopeful the latter is close to making a long-awaited return to training. Despite the lack of experienced depth, Caley Jags have maintained an impressive run of 25 league matches without defeat which stretches back to March. Canadian international Trafford has been impressed with the way his side have dealt with being reduced to the bare bones, with the Highlanders returning to Championship action when they host bottom-of-the-table Falkirk on Saturday. Trafford said: “Obviously there are pros and cons to it. We need to stay healthy and stay away from suspensions. “The atmosphere in the dressing room is fantastic. The boys are sticking together. Everyone is close and we’re backing the injured lads to get back as quick as they can. “There’s a good vibe and confidence in there. “It isn’t always like that. Once you get to this level in professional football it can be a funny dynamic in the locker room. “Normally, there is a ruthlessness that people don’t see from the outside. With the pressures and competitiveness, at times it does feel like an individual sport. “Obviously players need to be close enough that they play well together, but you’re fighting with the next guy beside you for a living. It is a hard thing. Trafford hopes to regain his place in the side for the visit of the Bairns, with the 26-year-old adding: “It is about the team winning, I want to win the league this year. I had a bit of a frustrating few weeks there not playing. The team were drawing but obviously I wanted us to win those games, so I tried to stay patient and as sharp as possible.